The Fellowship was fortunate enough to obtain a copy of BLOODSHOT REBORN #1 from Valiant Entertainment. Jeff Lemire writes, Mico Suayan draws and David Baron colors. Who was Bloodshot? He was an unkillable assassin, powered by nanotechnology and corporate masters who kept his memory wiped. He was saved from that by the Geomancer, who removed the nanites from his blood. But now all he has are the memories of people he killed and ghosts of his past. Then an apparent impostor goes on a rampage, killing innocent people in a theater. So who was Bloodshot, and what’s he going to do about it? Bloodshot deserved a chance to be a normal person (since he had his condition thrust upon him). It’s not surprising, though, that someone like him would be able to deal with it. This is an interesting look into his mind, though; we get a good look at how he views himself and his place in the world. The level of detail in the facial expressions is impressive, too, and helps to tell that story. There’s a ton of psychological depth packed into this single issue. And I suspect there’s more to come. So jump on board now. 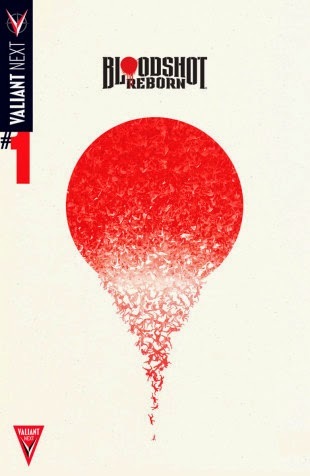 BLOODSHOT REBORN #1 is available now at your FLCS or at valiantuniverse.com.